One of the things I enjoy doing when not writing is gardening. Whether outside or inside, I adore plants. All kinds of plants. From the most common to the exotic. This is a tale about a plant that many would call unusual. I love it! My husband fondly calls it ‘Monster’. And when I care for it, he calls me, ‘Morticia’. I don’t really spray dust on it. My love for Monster started years ago, when a friend asked me to care for her plants while she was on an archaeology assignment in Africa for several months. Monster took up prime real estate in the west facing window of our kitchen. 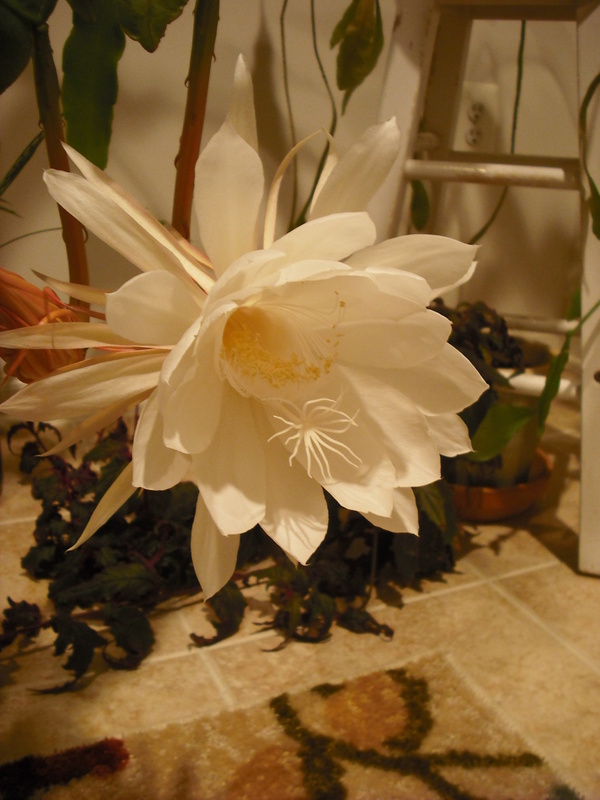 One night, she bloomed. The most beautiful flower I’d ever grown. So…I took a cutting. Just one shoot. Seven years later, you see the plant above. In those seven years, it never bloomed. Now here is the thing–the thing that feels supernatural…the other morning these appeared. Tune the theme for Little Shop of Horrors. The last picture is from the following morning. 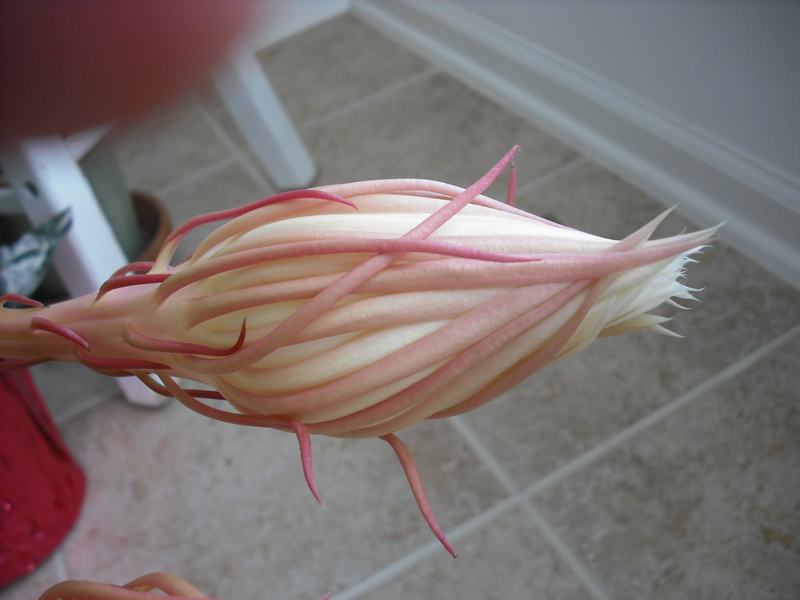 The Night-blooming Cereus flower lasts for only one night then it’s gone. Dawn, I had one for 3 years before it bloomed, and it was exactly as you said. The bud is quite alien-looking! But the bloom is worth the wait! My grandmother has a pink one. Lovely! It’s lovely, but did you have to feed it blood? *g* Seriously, you are dedicated! When my mom passed, she had a leaf of this plant started in water on her kitchen sink. 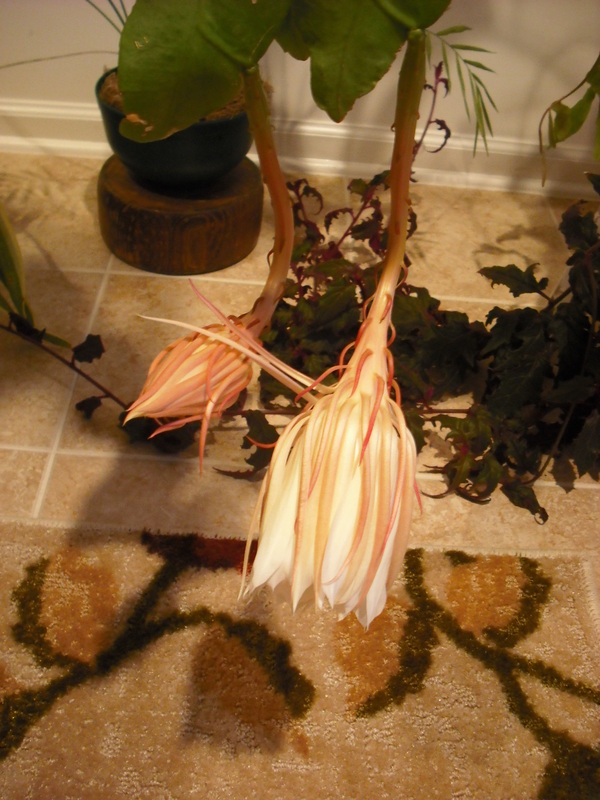 I had no clue as to what it was, but I figured she wanted to grow it, so I took it home, planted it and two years later, it bloomed two of the strangest looking pink flowers on one stem. Only because it had one stem with leaves. I found out then what the plant was. Now I have another stem growing about 4 feet tall and no leaves on it yet. I figure it will start to droop eventually. I do enjoy your pic of your plant, it looks a lot like mine only yours is bigger. Thanks! Hello. The plants are truly wonderful. I repot occasionally with Miracle Grow potting soil which contains slow release fertilizer. Sounds like a plan. Enjoy your plant! 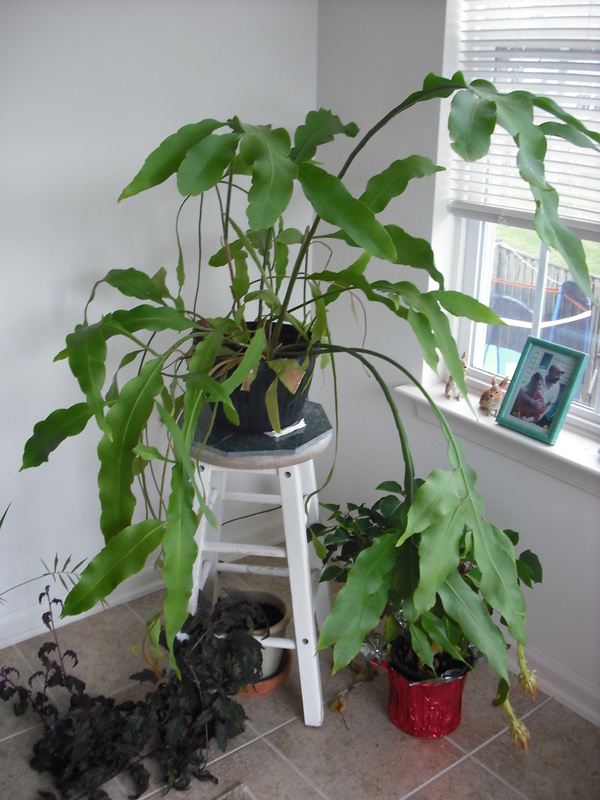 I have my grandmother’s “parent” plant but it has not done well over the years. The stems grow, but then all of a sudden start drying out and turn black. I then have to cut it back. I have a few shoots in other pots. Not one seems to thrive. I have miracle grow soil at home. Will try to repot in that. I have had it in a bright location and it did not do well. I have had it in a sunny window (I’m in Ontario, Canada). 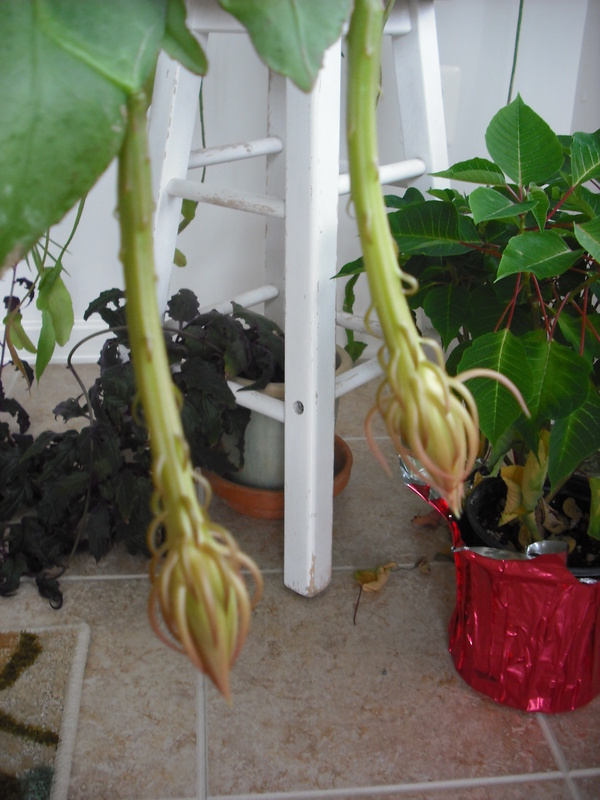 Nothing makes this plant happy…..it is probably 30-40 years od so I don’t want to lose it! Hi, Sini. 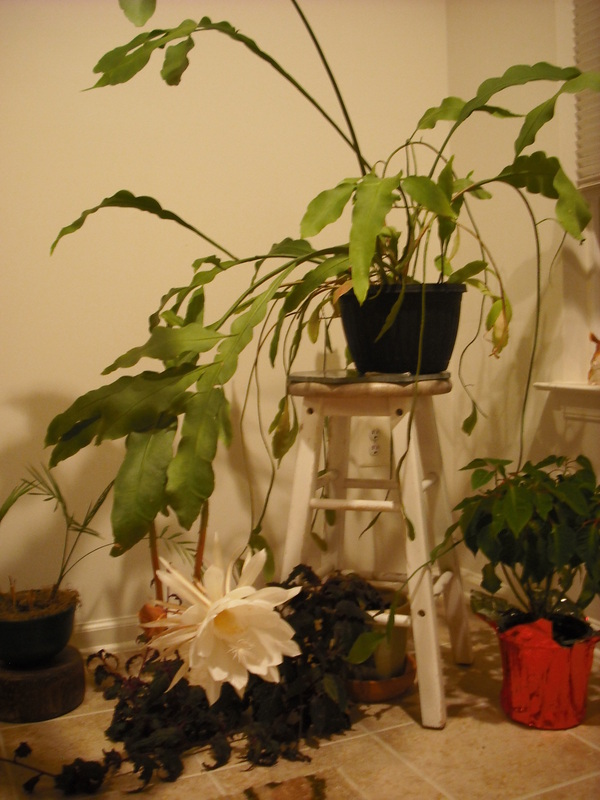 The monster plant shown in the pictures above receives filtered afternoon light and is planted in Miracle Grow potting soil. I have another plant that is about three years old from cuttings that receives morning light, which has beautiful foliage, but has never flowered.